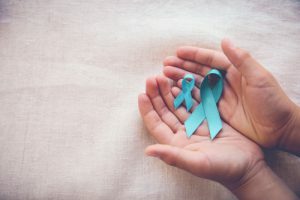 An estimated 15 percent of ovarian cancer diagnoses are linked to genetic predisposition, or hereditary factors passed down through family genes. The vast majority of hereditary breast and ovarian cancers are caused by mutations in the BRCA1 and BRCA2 genes. In the general population, these mutations occur in one out of 500 people. With an even higher incidence rate, those of Ashkenazi Jewish descent have BRCA mutation occurrences at one in 40 people. Lynch Syndrome is another inherited condition that may increase ovarian cancer risk, though it is more commonly associated with increased risk of cancer of the digestive tract. A woman with Lynch Syndrome has a nine to 12 percent chance of developing ovarian cancer in her lifetime. For families with strong ovarian cancer prevalence but no identified genetic mutation, the exact risk factor remains unknown. Researchers and doctors continue to work towards identifying more possible genetic indicators of ovarian cancer. A BRCA mutation can be inherited from either parent, and is a risk factor for ovarian, breast, pancreatic, prostate and other cancers. Carriers of a BRCA gene mutation face a lifetime risk of ovarian cancer between 10-60 percent. Genetic counseling and testing is the best way to identify hereditary ovarian cancer risk, especially in families with a strong history and prevalence of ovarian cancer and breast cancer. If an ovarian, fallopian tube, or peritoneal cancer patient received a negative genetic test more than 3 years ago, they should speak to their doctor about retesting due to advances in the testing technology. The National Comprehensive Cancer Network (NCCN) and the Society of Gynecologic Oncology (SGO) publicly states that all women diagnosed with epithelial ovarian, fallopian tube, and peritoneal cancers should receive genetic counseling and consider BRCA genetic testing, even in the absence of a family history of cancer. Patients who carry a BRCA gene mutation may respond more favorably to platinum-based chemotherapy, and may lower the potential for certain treatment side effects. There are clinical trials enrolling now specifically for ovarian cancer patients who carry BRCA gene mutations. Your healthcare team can help determine if you are eligible to participate in a particular clinical trial. Click on the “Clinical Trials” tab below for more information. This article was originally posted on Ovarian.org.